The Department of Defense Inspector General’s report on Operation Freedom’s Sentinel is provided to Congress every quarter. The latest report published in late November covers the period of July 1st to September 30th, 2017. This 130-page report covers five key areas – security in Afghanistan being one of those five topics. Within the security portion of the report an update on Afghan Special Security Forces (ASSF) is provided. The highlights of the ASSF are provided below. Effectiveness of the ASSF. According to the report “. . . the ASSF continued as the most effective fighting force within the ANDSF despite often conducting operations outside of its special operations mission set.” Past reports and news story accounts say that 70% of the offensive operations conducted by Afghan security forces are conducted by the ASSF. The Ministry of Defense has at least ten Special Operations Kandaks (SOKs) as well as a number of support and specialty units. The National Mission Brigade (NMB) provides elite units for counterterrorism operations. The Ministry of Interior has elite police units such as the Crisis Response Unit and police special units at provincial level. ASSF to Double in Size. 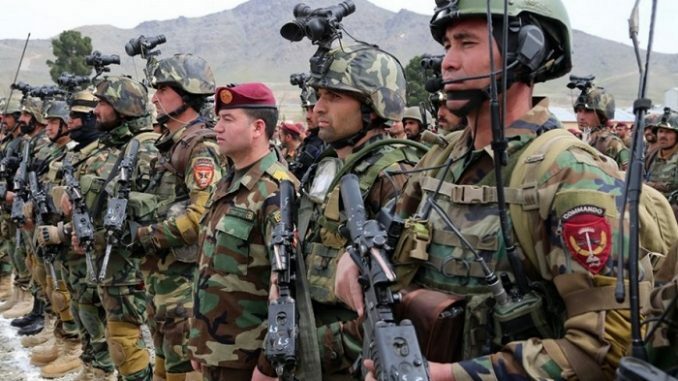 The Afghan government is embarking on the task of doubling the size of the Afghan special operations units in the Ministry of Defense (MoD) and Ministry of Interior (MoI) over the next few years. Quality of Recruit Pool for the ASSF. Afghanistan is a country with one of the highest illiteracy rates in the world. The recruits needed for the ASSF need to be of high quality; this could pose problems for recruitment goals. Advising at the Tactical Level. U.S., NATO, and other Coalition nation SOF have been advising special operations units of the MoD and MoI for several years. Even now, SOF units can be found at the tactical level (kandak) providing training, advise, and assistance. In addition, foreign SOF units are working at the training and institutional level with the ASSF. Rationale for Expansion. The ASSF are over-used but very effective. Increasing the number of Afghan SOF units will lower the operational tempo of the special operations soldiers and units. At the same time the increase in size will allow the ASSF to become the primary offensive force of the Afghan National Defense and Security Forces. Special Mission Wing (SMW). The air component of the ASSF – the Special Mission Wing – will soon be receiving refurbished UH-60 Black Hawk helicopters to replace their aging Russian-made Mi-17 utility helicopters. The Afghan Air Force will eventually be fielded 159 UH-60s with a portion of these allocated to the SMW. The Special Mission Wing continues to be tasked with supporting non-SOF units which takes away its effectiveness in supporting Afghan SOF ground units. ASSF and OFS CT Mission. Some units of the Afghan SOF are working closely with U.S. SOF units engaged in the Operation Freedom’s Sentinel counterterrorism mission. These Afghan SOF units work in partnership with U.S. SOF units pursuing al-Qaeda and ISIS-K targets. Much of these operations have been taking place in Nangarhar and Kunar provinces along the Pakistan border. Importance of the ASSF. The United States and its NATO and other coalition allies have placed a lot of hope on the ability of the Afghan Special Security Forces and the Afghan Air Force to defeat the Taliban insurgency. While offensive action will certainly go a long way to defeat Taliban units in the field and to ‘clear’ terrain of insurgents – someone has to ‘hold’ and ‘build’ once the Afghan SOF units move on to the next target. At the moment the Afghan Army and police have proven themselves very inept at the ‘hold’ mission while the government has failed in the ‘build’ (governance and development) part of the ‘clear, hold, and build’ concept of counterinsurgency. See page 8 of the report. The personal observation of this writer is that the effectiveness of the conventional ANA units is very questionable. The conventional ANA suffers from poor leadership at the senior and mid-grade level, is plagued with corruption, has a ‘checkpoint mentality’, and is very reactive in nature. Afghan Army SOF commandos and special forces are trained up at Camp Commando located on the outskirts of Kabul. Many NATO and U.S. personnel will remember it as Camp Morehead.